Math and theatre initially seem like odd bedfellows. After all, math is grounded in undeniable realities, while theatre tends to take liberties with that, shuttling between the abstract and absolute to produce art. 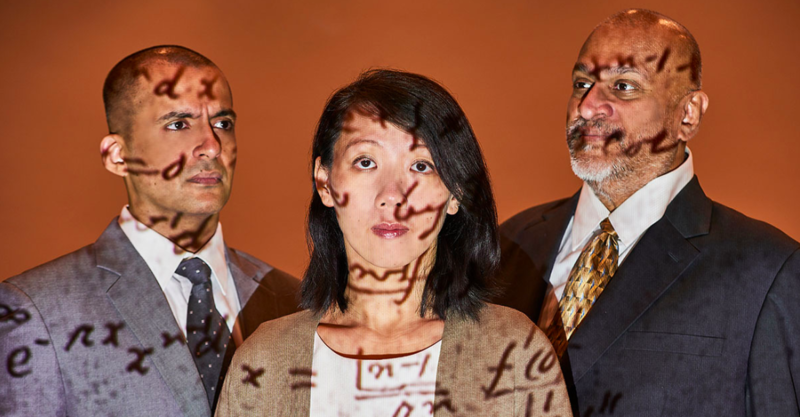 Yet, with 2019 NUS Arts Festival opening show A Disappearing Number, director Edith Podesta attempts to prove the theorem that math and theatre can coexist, with surprising parallels that can be applied to our understanding of life and the universe itself. Originally conceived and directed by the legendary Simon McBurney of Complicité, A Disappearing Number makes its Singapore premiere with professional actors Remesh Panicker, Koh Wan Ching and Pavan Singh, alongside students from NUS Stage. While it begins innocuously with a ‘math lecture’, as Koh Wan Ching teaches the audience about sequences, A Disappearing Number quickly morphs into a sprawling, ambitious theatre production that spans multiple timelines, countries, characters and of course, mathematical concepts. In the play’s primary narrative, we follow a math professor and a businessman who fall in love, a relationship doomed from the start. In 1913, mathematician G.H. Hardy receives a theorem-filled letter from Srinivasa Ramanujan, a clerk in India destined to become a mathematician of renown himself. A Disappearing Number is a challenging play, both to stage and for audience members. Scenes are brief and often jump between time, narrative and theatrical style, making it difficult for actors to fully establish their characters each time and for audiences to have enough time to immerse themselves fully in each moment. There is a valiant effort across the cast in making the scenes work, particularly with the NUS Stage members in their enthusiasm (the female cast members in particular deserve praise), and it certainly is no easy feat to perform a 110 minute play without intermission. However, there is the sense that this was quite simply, an incredibly ambitious play that attempted to do too much, often losing both actors and audiences within its content. One feels that some of the most effective scenes seen over the course of the play are in fact, those that put emotion as the forefront rather than mathematical theorem. In particular, these are the scenes led by Remesh Panicker, at times breaking the fourth wall to deliver clear, amusing meta-theatrical commentary on the nature of reality versus the artistry seen onstage, or as a physicist in the final scene, where he and Pavan gaze out over the river Ramanujan used to bathe in, exchanging one of the few genuine conversations in the play between strangers come to mourn. While the huge space of the UCC Hall certainly posed an additional challenge, Edith manages to effectively use her creatives to fill the space and overcome these limitations. Tabla player Nawaz Mirajkar provides live music, thematically fitting the setting of India and issues of Indian-ness across the play. Meanwhile, multimedia designer Brian Gothong Tan has put out some good video projection work here on a huge screen spanning the entire stage, helping immerse audience members in every scene. One practically feels as if we ourselves are caught in a storm as we see raindrops gathering and dripping down a window, while we feel like we are rushing across the distances of India as we ‘peer out’ a train offering sprawling landscape views. Tan even manages to illustrate and present some of the theorems raised during the play artistically, such as an infinitum of parallel realities as Wan Ching and Pavan argue, a reference to string theory briefly mentioned earlier on in the play. Underneath the mass of mathematical jargon and sprawling history, there is a gripping story and so much potential for A Disappearing Number to make a strong case for the significance of math and life. Podesta creates a particularly haunting final scene as the entire cast comes together to fill the black space of the stage, moving slowly, synced up as if the themselves have become integers of an infinite sequence, where math itself feels completely, utterly integrated into life. But this ultimately is a case of too little too late, and for a play about finding truth in theory and comfort in the mysterious connectivity of the universe, the fractious A Disappearing Number instead feels disconnected and aloof, the sum total a far cry from the infinities they reach for.